G.P. Putnam's Sons, 9780399173806, 464pp. FBI agent Nicholas Drummond and his partner, Mike Caine, are deep into an investigation of COE--Celebrants of the Earth--a violent group known for widespread bombings of power grids and oil refineries across the country. While investigating a tip from a civilian who's overheard about a possible bombing plot, the Bayway Refinery in New Jersey explodes. Nicholas and Mike race to the scene and barely escape being killed by a secondary device. Returning to the civilian's home to continue their interrogation, they discover the tipster--and the FBI team left to guard him--dead. While Nicholas calls in the assassinations, COE strikes again, this time launching a cyber-attack on several major oil companies and draining their financial and intellectual assets. Working with the CIA, the Secret Service, Mossad, MI-5, and even Savich and Sherlock, Nicholas and his team put their lives on the line to prevent another conflagration--and save the President. Catherine Coulter is the #1 New York Times bestselling author of the FBI Thrillers featuring husband and wife team Dillon Savich and Lacey Sherlock. 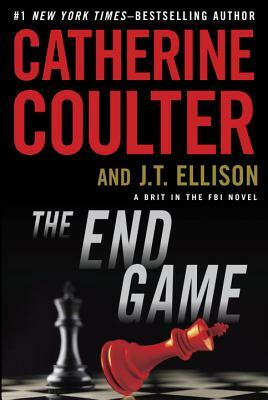 She is also the author--with J. T. Ellison--of the Brit in the FBI series. She lives in Sausalito, California. J. T. Ellison is the bestselling author of twelve critically acclaimed novels, including What Lies Behind and When Shadows Fall, and her work has been published in more than twenty countries. Her novel The Cold Room won the ITW Thriller Award for Best Paperback Original and Where All the Dead Lie was a RITA(R) Nominee for Best Romantic Suspense. She is also coauthor of the Brit in the FBI series, including the New York Times bestsellers The End Game, The Lost Key, and The Final Cut.